:Marian Eng, age 91, of Knapp, Wisconsin died Saturday, May 5, 2018 at Park View Home in Woodville. GRAVESIDE SERVICE for Marian is Thursday, May 10, 2018 at 11 a.m. at Wilson Lutheran Cemetery, Wilson, Wisconsin. VISITATION will be Wednesday from 4:30 until 6:30 p.m. at Keehr Funeral Home, Spring Valley. Burial will be in Wilson Lutheran Cemetery, Cady Township, Wisconsin. 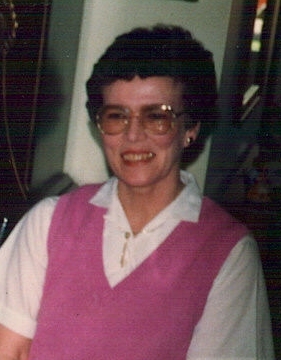 Marian was born on the home farm south of Knapp on July 16, 1926, daughter of John and Mary (Lien) Eng. She was baptized and confirmed at the Wilson Lutheran Church and was a lifelong member. In her growing up years she was so proud to know her mom and dad had come from Norway to live and had many aunts, uncles, and cousins in Norway. She completed 8 years of grade school at Cady Creek. Bernice Jensen was her teacher for her last 3 years at Cady Creek. She attended Spring Valley High School and graduated with her Class of 1944. That same fall, she attended Vocational School in Eau Claire, Wisconsin. She worked for a short time at International Harvester Company, then at W.H. Hobb Supply Company for a number of years where she was called “Ingaborg” by some of her friends. Some years after her retirement she moved back to the home farm at Knapp to help out her brother and sister. She is survived by step-niece Lena Gaul of Sycamore, Illinois; and other relatives and friends and her cousins in Norway. She was preceded in death by her parents; sisters Selma Eng and Olga Morrison; brother Simon Eng; infant baby sister (1925); brother-in-law John Morrison; step nephew and wife Johnny and Roxie Morrison; and niece Marcia Ann Eng (1946).